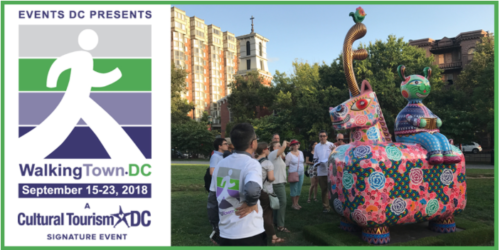 Sign Up for WalkingTown DC Tours! WalkingTown DC photo illustration. Courtesy of Cultural Tourism DC. Have you ever wanted to go for a walk, but one that is narrated by someone who really knows what they are talking about in terms of history, architecture, the lowdown and the dirty gossip from an era long gone? Then get your clicking fingers ready and clear your calendar from Saturday, September 15 until Sunday, September 23: Cultural Tourism DC, a non-profit whose mission is, literally, to make sure you have as great a time as possible while learning about cultural experiences at a national and international level, is holding their annual WalkingTown DC! This week-long series of tours are designed to help you explore and discover parts of town that you may otherwise not know. Many of the tours are slow-paced and have accommodations for limited mobility. All of them are led by expert tour guides. Some of these guides have pretty much written the book about this wonderful District of ours, so for a volunteer donation of $7.50 you are getting an unforgettable and enriching experience. Are you pumped? I hope so! I still remember fondly my first WalkingTown tour: It was a guided tour of the Capitol grounds, led by Steve Livengood, who happens to be Director of Public Programs and Chief Guide at the United States Capitol Historical Society. After that tour, I developed a serious crush on Frederick Law Olmsted. I’m still not over him. Register for any or all of the tours by clicking here. By the way, if you’re a seasoned pro and just want to help the mission of Cultural Tourism, as well as making sure that the latecomers know where to find the group, you can sign up to volunteer during WalkingTown. Click here to sign up! Still on the fence? Here is a selection of the tours closest to our neighborhood (most are in Ward 6). You can take a walk or a bike ride and be close enough to brunch right afterward! You know you want to! Architecture + Art in NoMa: In the heart of DC, the burgeoning NoMa neighborhood is where the old city meets the new city. Learn about structures that embody the District’s — and the nation’s — deep history, including the Government Publishing Office, Uline Arena, and the Postal Museum. Get to know more about the buildings that have arisen over the past two decades, including the headquarters of National Public Radio. Along the way, see lots of public art, including numerous murals that enliven building walls, providing surprise and delight. Tour takes place outside only, no interiors. Castle to Capitol: The Architecture of Iconic Buildings on the National Mall — Washington’s best-loved museums line the east side of the National Mall, laid out between the Capitol Building and the Washington Monument. Called the “Nation’s Attic”, the Smithsonian Institution is one of the largest museum complexes in the world, with 30 million annual visitors, 19 museums, and over 150 million items in its collection. Each building is an architectural landmark, from the unique Smithsonian Castle and Hirshhorn Sculpture Garden to the Museum of the American Indian and more. Discover how the Smithsonian Institution has shaped the National Mall since 1855. Creating Capitol Hill: Place, Proprietors and People — See the neighborhood and historic sites described in Creating Capitol Hill: Place, Proprietors, and People, the U.S. Capitol Historical Society’s latest publication. Explore the streets around the Capitol as you learn about the circumstances and compromises that were necessary to create a permanent seat for the federal government. From structures still standing to those long-since destroyed, discover how hundreds of acres of wooded farmland became one of the most important communities in the nation. DC’s Instagram-able Marvelous Murals Bike Ride (bike tour, obviously): There are so many new murals in the DC area. Some are in plain sight, and others are tucked away. Take a ride with the Washington Area Bicyclist Association (WABA) to appreciate some of the city’s newest wall paintings and discover some tricks to travel confidently through the city by bicycle. Frederick Law Olmsted and the U.S. Capitol Grounds: Commissioned by Congress in 1874 to design the grounds of the U.S. Capitol, Frederick Law Olmsted created an innovative landscape, presenting the building to greatest visual effect while overcoming numerous design challenges. Explore the history and design of the Capitol Grounds while learning about its intricate features: the Olmsted-designed marble terraces; brick Summerhouse; masterful stone and ironwork; and carefully constructed views and circulation paths. Presented by the National Association for Olmsted Parks and United States Capitol Historical Society and led by volunteers for the USCHS. Gallaudet University: A National Treasure — Gallaudet University is the world’s only liberal arts university for deaf and hard of hearing students. The University is known for its Olmsted landscapes and Victorian buildings, as well as for its educational excellence. See the Edward Miner Gallaudet Residence, a mansion built for the University’s founder and first president. Learn about the Gallaudet University Museum in Chapel Hall, a post-Civil War building with elegant arches and an iconic Tower Clock that still serves as the focal point of the college. H street NE: At the Heart of Hip: See H Street NE through the lens of social justice and the interplay of this historic area’s rise as a thriving commercial center to its fall after the riots in 1968 and to its present. Focus on how gentrification and development are playing out today on a street that is known as a battleground for racial and economic tensions in DC. An interactive experience, the tour offers participants a group discussion about the practical implications of gentrification. Kingman Island (bike tour): Join Tommy Wells, Director of DC’s Department of Energy and Environment, for a bike ride to and walking tour of Kingman Island. Cyclists will ride up Anacostia River Walk to the island, where Director Wells will lead a walking tour and talk about the future of the island and what makes it special. You will learn about the island’s birth in 1916 and the environmental efforts to maintain its ecosystem and environs as well as the work to clean up the Anacostia River. Marching Along with John Philip Sousa: Musical history comes to life on a “marching” tour of the important sites in the life of conductor and composer John Philip Sousa. Fall in step with your guide, in character and in uniform as DC native son John Philip Sousa, as he leads guests on an amazing expedition of Capitol Hill and the Navy Yard where Sousa was born and raised. A legendary composer, he wrote over 135 marches. Two of the most famous are “Stars and Stripes Forever” and “The Washington Post March”. Queering Capitol Hill: Capitol Hill has long been a social and residential center for Washington, DC’s gay and lesbian community. It has also been a center for bars and clubs, innovative women’s businesses, and a variety of communities. Come hear stories of radical lesbian separatists, First Amendment fights, the underpinning of LGBT religious organizations, interactions with Marines, the community’s response to AIDS, and other tales from seven decades of gay and lesbian life in the shadow of the Capitol. Outdoor tour only.